Amongst the new for Orgatec, we introduced new versions of some iconic pieces of the firm adapted to the needs of the updated workplaces, which respond to the key challenge of turning them into a dynamic, fluid and creative space. The open office trend requires new elements which provide privacy and avoid the acoustic problems that can occur in these open areas. Tartana provides just the right dose of intimacy and protection, without killing cross team collaboration. The new feature of the Tartana is its optional integrated LED lighting that enhances its use as a “ceiling” for working areas. As a result is a great source of light to work efficiently and relaxed. In addition, the Soul fabric selection has been extended to include the sand, bloom, cobalt and fog colours, with the same acoustic properties as the existing range. The REW, Menú and La Isla join the “smart working” era by adding a wide variety of USB ports (A or C) and international power sockets. 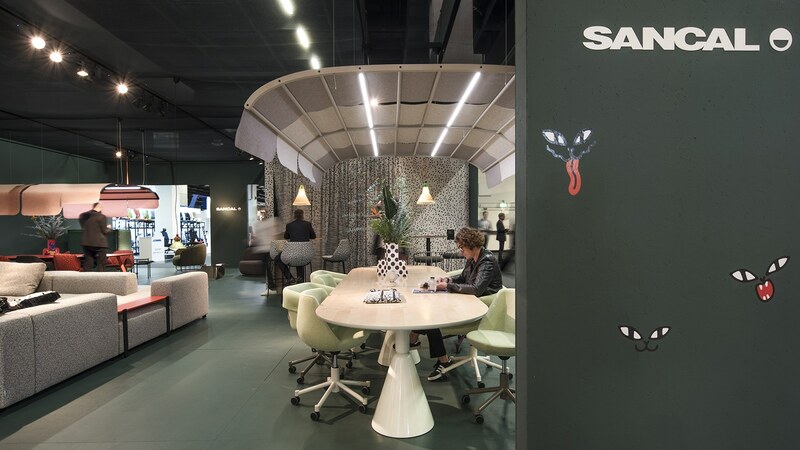 In this way, Sancal responds to one of the main needs of professionals who spend much of their time away from their desk. These new variants of some of the brand’s favorite products brings them up to speed with today’s office sector and its evolving culture of work. Sancal presents a winning swivel and height-adjustable base that Rafa García has standardised for the best-known chairs from the catalogue: Nido, Magnum, Mullit, Collar and Tea. The five-star base in F1 steel, can be personalised by lacquering it in any of the colours on the brand’s chart.